Our Vision: To live in a world where every child knows their true beauty and intelligence. The World of Entertainment, Publishing and Inspiration (World of EPI) was formed in 2003 with the mission of spreading joy by providing children with dolls that inspire dreams, promote intelligence and build self-esteem. We are guided by our hearts in creating beautiful multicultural products for multicultural children. We like to view ourselves as partners with parents and global communities by providing tools that lift the self-esteem of all children of color. I am a mom and former professor. I’ve always wanted to inspire young people. In 2003, I formed the World of Entertainment, Publishing and Inspiration (World of EPI) with the mission of spreading joy by providing children with dolls that inspire dreams, promote intelligence and build self-esteem. Building self-esteem is the cornerstone of all the work I do, because low self-esteem can limit a child’s potential. As a professor who had experienced low self-esteem, I quickly recognized it in the young women in my classes. One day while watching an updated doll study, I saw a beautiful little mocha skinned girl say she didn’t think the brown doll was pretty because its skin was nasty. She then touched her own hand and said, “just like mine”. As my heart broke and tears flowed down my face, I said, “Oh my goodness this begins in early childhood.” At that moment, I knew I had to create dolls for multicultural girls. This journey has not been easy, but every morning I’m inspired to continue creating dolls that honor our children. In 2009, I created Positively Perfect Dolls (PPD), which includes 18" and 14" baby dolls. These award-winning dolls have custom blended skin tones, beautiful full lips, cute noses, and natural hair textures and styles. The line started with just two African-American dolls at one retailer. The collection has grown to over 20 dolls representing African-American, Latina, and Middle Eastern girls. Positively Perfect now has a doll fashion line and accessories. The PPD Collection is being distributed in the US, Australia, Dubai, France, South America, Mexico, Switzerland and in other parts of the world. For four years, I’d carried the dream of creating a multicultural fashion doll line in my heart. I wanted older girls to see multicultural beauty reflected back to them during play. In 2017, FRESH was launched. They are called FRESH because they’re a new perspective on dolls. These dolls have custom blended skin tones, beautifully authentic facial features, trendy fashions and hairstyles that include, braids, afros, afro-puffs, wavy and curly styles. FRESH doll bodies are specifically designed to be more representative by having fuller hips, thighs and more realistic waists. I designed the dolls to be poseable so girls could dream of what they want to become while posing, bending, and playing with their dolls. Since traditional dolls clothes will not fit these shapely bodies, FRESH dolls have their own fashion line that is “elegant with an edge”. Everything we do at the World of EPI centers around love and self-esteem. We love all children. We love creating dolls that honor the beauty and intelligence of multicultural children. We are here to support you in raising beautiful, confident children with unlimited possibilities. Anytime a World of EPI doll is purchased, a donation is made to a national charity that supports and uplifts children. When you take a doll home to the amazing child in your life, present it to them with a loving kiss. In turn, I hope each doll gets tons of hugs and kisses, too. 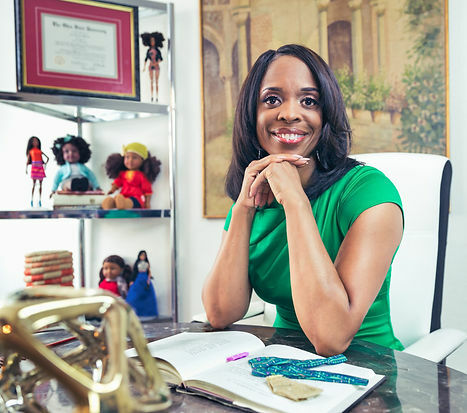 Dr. Lisa Williams is internationally recognized as an academic trailblazer, founder of a multi-million dollar company, an award winning speaker and author. Through hard work and perseverance Dr. Lisa attained unprecedented success by becoming the first female professor to receive a multi-million dollar endowed chair, the first African American professor to earn tenure at Penn State University, and the first African American to receive a doctorate in Logistics from The Ohio State University. At the height of her career, Dr. Lisa did the unthinkable when she left the academic life to blaze a new trail as an entrepreneur. In 2003, she founded the World of Entertainment, Publishing and Inspiration (World of EPI), LLC. EPI is the classic Cinderella story. Dr. Lisa grew the company from negative revenues into a multi-million dollar powerhouse. EPI is now a leading multi-cultural toy manufacturing and design firm with a global supply chain that crisscrosses the world from the US to China and other worldwide destinations. EPI is an industry innovator having created both the Positively Perfect and Fresh Doll Collections. The doll collections represent African American, Latina, and Middle Eastern. They are sold in Walmart, Target, Toys R Us, Meijer, Kohl's, Walgreens and international markets such as, United Kingdom, Dubai, Australia, France, South America, Canada, etc. EPI’s largest customer, Walmart, awarded Dr. Lisa the Supplier of the Year Award for her visionary leadership. EPI touches the lives of an entire generation of children through its Positively Perfect Doll Line and Fresh Doll Collection. Dr. Lisa was featured in the book 50 Billion Dollar Bosses, on the covers of Black Enterprise and The Grio Magazines, and she was interviewed by Tamron Hall on News Nation. Recently, Dr. Lisa was named an Ernst & Young Entrepreneurial Winning Women class of 2013. While featured in many books and magazines for her expertise in business, she is also known for her ability to motivate executives, future leaders and audiences of all sizes. In addition to winning numerous teaching awards from major universities such as, Penn State, The Ohio State and the University of Arkansas, she has been awarded the Outstanding Female Faculty Member of the Year from Penn State University, designated as an Amazing Woman by University of Nevada Las Vegas (UNLV) and given the Trailblazer Award by the American Marketing Association PhD. Project. Dr. Lisa was given the highest honor bestowed upon a faculty member – an endowed chair. Upon receiving the award she said, “This is like receiving the Academy Award for Faculty.” Actually, Dr. Lisa has been given this honor – not once but twice – in three years. Major corporations and President Clinton’s Commission on Critical Infrastructure Protection have sought her advice. Her peers and students alike recognized her as a leader in the field of business and supply chain management. Dr. Lisa has been ranked by the most prestigious journal in the field for the number of articles published. Her research has been published in the Journal of Marketing Channels, Journal of Business Logistics, the Transportation Journal, The International Journal of Physical Distribution and Logistics Management and the International Journal of Logistics Management. Her column Profiles in Leadership has been published in the Supply Chain Management Review Magazine.